VATICAN CITY, September 7, 2012 (ENS) – French automaker Renault has presented Pope Benedict XVI with two electric vehicles designed and built to meet the the pontiff’s needs. Known as the “Green Pope” for his attention to environmental issues, Pope Benedict has frequently underlined the need for sustainable development to safeguard Creation. Chairman and CEO of the Renault Group Carlos Ghosn presented the vehicles to the Pope on Wednesday at his summer residence Castel Gandolfo, in the Alban Hills south of Rome. “This donation to His Holiness is a means for Renault to reaffirm its strong and durable commitment to sustainable development and respect for the environment,” said Ghosn. The unique vehicles were unveiled to the press on Thursday. The vehicles are based on Renault’s Kangoo Maxi Z.E. light commercial van and were developed in association with the French coachbuilder Gruau as an ecological, sustainable version of the Popemobile. The white one with the Papal coat of arms on the doors is intended for the pontiff to use when traveling at his summer residence. With a range of 170 kilometers (105 miles), it is powered by a 44kW (60hp) electric motor and a lithium-ion battery. 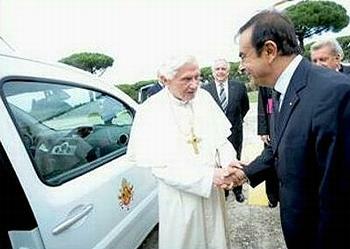 Renault donated the second electric vehicle to the Corps of Gendarmerie of Vatican City for the Pope’s security. It is of similar design but painted blue with a white and yellow stripe along each side. These vehicles can seat up to four people and are fitted with two especially comfortable separate seats at the rear. They feature opening roofs, removable rear side windows, hinged rear side doors and electrically folding door steps. The Vatican said the Pope used his new car on Wednesday to travel from the helipad at Castel Gandolfo back to his palazzo after presiding over his weekly audience at the Vatican. Vatican spokesman Federico Lombardi said the new Kangoo would not be a Popemobile as it lacked security features such as bulletproof windows. In June, the Pope received his first electric car – a gift from the Italian company NWG Electric.